The bald eagle reaches new heights as we glide into football season. Meet Challenger. Not only is he an American bald eagle—and quite possibly the most famous eagle in the world—he’s one of Southwest Airlines’ most frequent flyers. Challenger is a 28-year-old bald eagle who accidently imprinted on a human when he was a young eaglet. Because of this, Challenger was unable to learn to live in the wild and was rescued by the American Eagle Foundation. The foundation quickly realized that Challenger was not like any other eagle, and his unique ability to respond to humans enabled him to become the first eagle to free-fly through stadiums during the long-standing tradition of the national anthem. Now, Challenger has flown at nearly 400 events, including the World Series and NFL Pro Bowl. 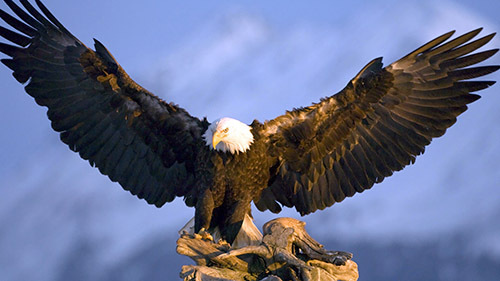 Through these appearances, Challenger has educated and inspired millions of people on eagle preservation. You may have even been onboard one of Challenger’s Southwest flights. Due to our special relationship with the American Eagle Foundation, Challenger has traveled on nearly 51 one-way flights since 2016. Southwest is honored to be a part of Challenger’s Team as he gears up to take flight. Be sure to keep your eyes peeled this fall during Challenger’s peak travel season. To see more of Challenger and find out what it’s like to fly from an eagle’s eye view, watch our video at swa.is/Challenger.